This may take 4-6 weeks to reach you. For more information, contact us. Don't wait. Order the eBook version instead. 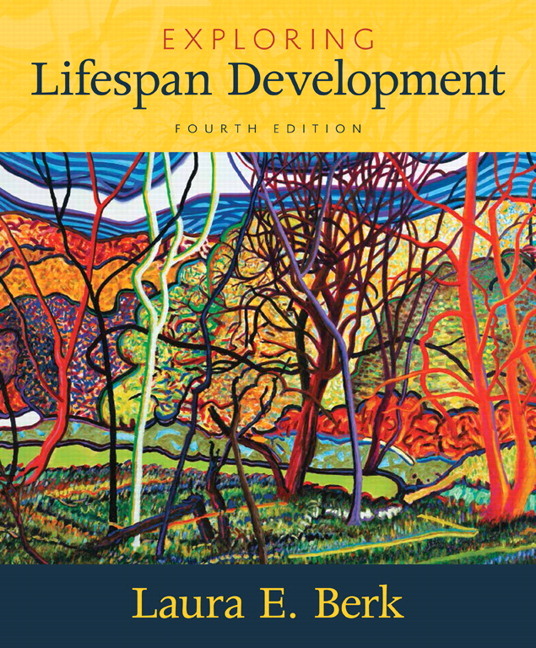 Exploring Lifespan Development, Fourth Edition, the shorter, essentials version of Development Through the Lifespan, Seventh Edition, covers the same topics and contains the same number of chapters, but presents only the essential information, with an exceptionally strong emphasis on applications. Exploring Lifespan Development also includes all the great features Berk’s texts are known for — an engaging writing style, exceptional multicultural and cross-cultural focus, rich examples, the most up-to-date research, and practical applications that help students relate the subject to their personal and professional lives. Meticulously researched material, including over 1,800 new reference citations, as well as the latest research and findings, reflects major changes and discoveries in the field, and is conveyed to the student in a clear, story-like fashion that humanises the complex developmental process. Integrated throughout the text, these applications show students how their learning relates to real-world situations. Applications are relevant to students pursuing a variety of fields, including psychology, education, nursing and other health professions, sociology, anthropology, family studies, and social services. The Look and Listen feature promotes active learning, asking students to observe what real individuals say and do, speak with or observe parents, teachers, or other professionals, and inquire into community programs and practices that influence children, adolescents, and adults. Applying What We Know tables provide practical real-life applications based on theory and research findings. Berk speaks directly to students, as parents or future parents and to those pursuing different careers and areas of study, such as health care, teaching, social work, or counselling. Multicultural and cross-cultural material is presented not only in the text's research and in many positive and diverse examples, but also through rich photos and figures, which enhance student interest and understanding. Cultural Influences boxes deepen the attention to culture threaded throughout the text and accentuate both multicultural and cross-cultural variations in development. These features support students’ mastery of the subject matter, inspire critical thinking, and help students engage with information on child development, applying it to the real word. Milestones tables summarise major physical, cognitive, language, emotional, and social attainments of each age period. In addition to offering an overview of change, each entry is page-referenced to provide the student with a convenient tool for review. Ask Yourself critical thinking questions have been thoroughly revised and expanded into a unique pedagogical feature. Three types of questions prompt students to think about human development in diverse ways: Connect questions help students build an image of the whole person by integrating what they have learned across age periods and domains of development. Apply questions encourage application of knowledge to controversial issues and problems faced by children, adolescents, adults, and professionals who work with them. Reflect questions personalise the study of human development by asking students to reflect on their own development, life experiences, and values. Biology and Environment boxes highlight the growing attention to the complex, bidirectional relationship between biology and environment. Cultural Influences boxes deepen the attention to culture threaded throughout the text and accentuate both multicultural and cross-cultural variations in development. Social Issues boxes discuss the impact of social conditions on children, adolescents, and adults, and emphasise the need for sensitive social and public policies to ensure their well-being. They are divided into two types: Social Issues: Health boxes address values and practices relevant to physical and mental health, while Social Issues: Education boxes focus on home, school, and community influences on learning.